10-100016-UK1 Time Clock Cards come in packs of 1000. Our clocking in time cards are precision cut so perfect every time. Compatible with numerous clocking in machines and mechanical time recorders. Need a clock card rack? Please see below the recommended rack for this card. Is your Ribbon faint? View our range of replacement time recorder ribbons here. Time for an upgrade? View our range of market leading biometric clocking in machines here. Why upgrade to a biometric Clocking In Machine? Using the distinct dimensions of a person’s fingerprint, geography of their hand or dimensions of their face, our biometric clocking in solutions provide proof positive accounts of employee time and attendance. Utilising advanced technology, our clocking in solutions map these unique characteristics into an encrypted biometric key; enabling unique identification. Old clocking in machines are a thing of the past. By employing a biometric clocking in machine you can prevent employees clocking for each other, it saves a lot of money in old time card preparation and calculation and no-one forgets their clock card because they are carrying it. If you need help in deciding which clocking in machine is best for your company then please contact our expert sales team. 1. What is a Clock Card? 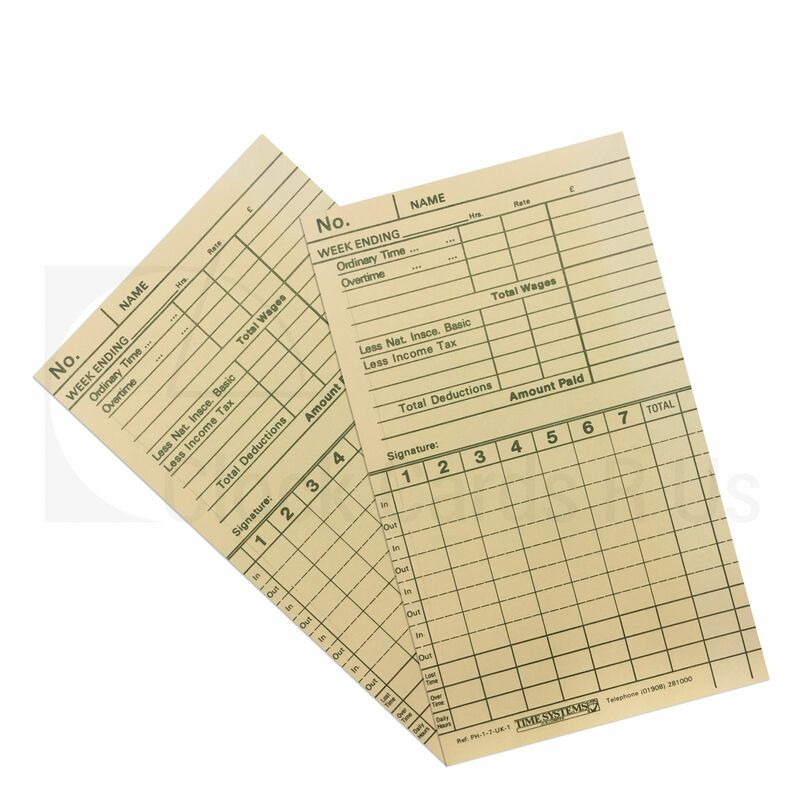 Clock cards also referred to as Time Cards are a paper based product to record hours of attendance at the work place. 2. How are Clock Cards used? Employee are issued with Clock cards and they insert them into the clocking in machine and the time and date or day are printed onto the clock card. 3. Do Clock Cards work in any time recorder machine? The short answer is no. There are thousands of different clock cards and each is different in some small way. Different machines require their own style of clock cards. More recently electronic machines can be programmed to accept different cards and older machines can have their width adjusted to accept wider or narrower cards. 4. Can I get my own Clock Cards printed? Yes you can, but printing clock cards is a precision business. The board must be of sufficient strength to withstand employee use and still fit into the clocking in clock. In most circumstances the board can only be strong if the board is thick and being thick it won’t fit into the clocking in clock. Then remember that the clock cards must be exact in width (and many times length is also an issue) and the rigidity must be down the card. When we say exact we mean exact. A 1/8” variation can cause the clock card to be useless. 5. Can I get Clock Cards printed on different colour board? Yes, call us for a price. 6. How are Clock Cards made? Usually, the board is made at the mill, from a special recipe just for clock cards, then made into large rolls. At the factory, they rotary cut, then trimmed to the exact size and printed. The board is part recycled. 7. How should I store them? In a dry place away from damp and sunlight and off the floor. 8. Advantages of a Biometric clocking in machine over Clock Cards? There are many reasons to use a biometric system instead of clock cards. Biometrics stop employees clocking for each other. There are no cards to write out or collect each pay period. There is no need to key the data into a database or work out the hours yourself. The biometric system will usually calculate hours worked and this is good for HMRC payroll filing rules.